Published Author, magazine and newspaper article writer. Healthy foodie trekker traveller sailor skier and scuba diver and golf lover. Wellness Coach by day (wellnesswoman.com.au) and writer reviewer in my spare time. Looking for a top day out? Norah Head Lighthouse ticks all the boxes. Of the 409 Lighthouses in Australia only as little as 3 are open to the public. Norah Head lighthouse is one such place and was established in November 1903. Thankfully, it has been lovingly cared for, allowing you and I to enjoy a very special unusual treat. You will see that practically all of its original fixtures and fittings still remain today, over 110 years later. The lighthouse is steeped in history and our wonderful tour guide (incidentally they are all volunteers) took us back in time with his extensive knowledge of the days when the Light Keepers would climb the 96 stairs every 30 minutes as they set about their task of keeping ships and sailing vessels safe from the rocks and the reefs around this simply stunning scape of NSW coastline. Lighthouses also have unique features so that any mariner at sea can identify them and know exactly which headland they are passing. Inside as you slap a hand against the cool white painted stone which was locally sourced and a metre thick in places it is comforting to be reminded of the strength and longevity of this wonderful piece of architecture. We were beguiled with facts and figures that seem just too incredible to believe considering the design of this beautifully kept lighthouse was over a century ago before computers were even heard off. The prism design in the lamp is incredible to see close up and would have been a full time job to maintain its sparkling condition in order for the light to be seen tens of kilometres away. Hard work and endless routine kept the lighthouse men very busy. Today it is fully automated and fuel is no longer carried up and down by hand. However, the condition of the light house is as pristine as it was required it have been then with floors clean enough to eat off. Whether you are thinking of visiting with an adult or considering a great trip for the grandchildren, you will not be disappointed. There really is a sense of 'being there' and imagining the men working here and their families living in the nearby cottages, being home schooled in the early days. I won't give any more away except to say at any time of year and in any weather it is a real surprise. You can go all the way to the top and enjoy spectacular 360 degree views which are superior to being on the balcony of any 5 Star resort A camera is an absolute must. Looking for an inexpensive but romantic surprise? Team this visit up with a picnic that can be taken on the surrounding grounds. Either way the tranquility of this sacred spot which is way too good to pass up. The cottages associated with the lighthouse are available as holiday accommodation and sleep up to 10 people. The Lighthouse and surrounding gardens are very popular for weddings too. Hmmm there's an idea? One way or another I will certainly be back. At just $6 per Adult and $5 for children this is indeed a memorable treat. A family pass is $20 and children under 5 are free. The Lighthouse is open to the public from 10am - 1.30 on every day except Anzac Day and Christmas Day. Also at Norah Head Lighthouse on Sunday 6th July at there is Whale of a Celebration in honour of the stoppage ruling for no more whaling by Japan - this is a free family event featuring local bands, whale watching and living art. See more at www.whaledreamers.org.au. 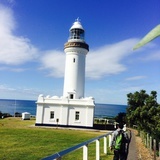 The Lighthouse is cared for by Norah Head Lighthouse Trust and the donations of generous benefactors. There is no funding by the Government. So we all need to do our bit to keep this glorious vestige of Australian history alive. Norah Head itself is a charming location with cafés and restaurants and shops if you want to make a full day of it. Toilets are situated in the car park just before the Reserve on Bush St. Please see the website details below for directions and further information.